Pelikan Edelstein Star Ruby Ink is Pelikan’s 2019 Ink of the Year color! This newest Edelstein ink is now the 8th “Ink of the Year” released by Pelikan. Sixteen Pelikan Edelstein ink colors have been released so far. Pelikan Edelstein Star Ruby ink and the other ink of the year colors are special edition inks, available for only a limited time. Each of these special editions have been fantastic and collectible inks. Edelstein means “stone” in German, and is Pelikan’s higher end ink brand. Edelstein inks, have good lubrication, nice medium to high saturation and perform quite well, with amazing vibrant colors. Every year we look forward to the next Pelikan Edelstein ink of the year color. Over the last 8 years, there has not been a disappointing color and we expect Pelikan Edelstein Star Ruby to be as successful as the rest. Remember once Pelikan Edelstein Star Ruby inks are gone, they will be discontinued as they are not slated to be part of the standard Pelikan’s Edelstein ink collection. Pelikan Edelstein Star Ruby ink is a deep dark pink color. Although pink ink may not be on everyone’s list of “go to” ink color, Pelikan Edelstein Star Ruby ink is dark enough to be used where red ink would be used and is bright, vibrant and shows up very well being a medium saturation ink. It will be wonderful also for notes, cards, journal entry or other projects requiring a dark pink color. Continuing reading for a chance to win the bottle of Pelikan Edelstein Star Ruby ink we used for this review. We used French-made Rhodia dot pad paper with a J. Herbin glass dip pen for this review. Other papers, pens, and nibs may produce varying results. 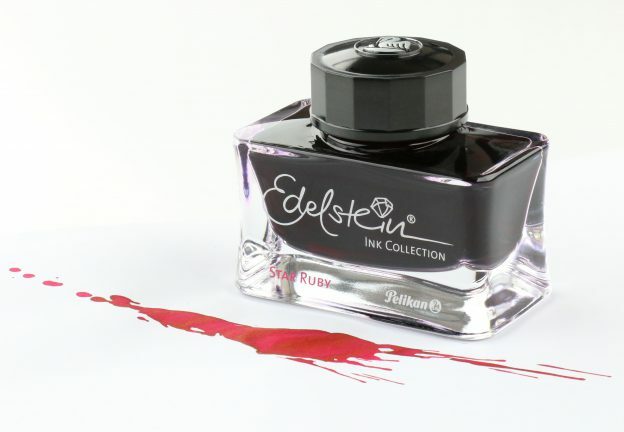 Pelikan Edelstein Star Ruby ink comes in the fantastic regular Edelstein ink bottle, which is one of our favorites. The Edelstein ink bottle is a heavy weighted rectangular ink well containing 50 ml. of ink. The large-mouthed opening and faceted lid make it easy to open and to refill any fountain pen. Pelikan Edelstein Star Ruby ink also comes in easy to use Pelikan cartridges. Finally, we offer Pelikan Edelstein Star Ruby ink in sample sized 4 ml. ink vials. These sample ink vials are packaged by Pen Chalet, not by Edelstein. Pelikan Edelstein Star Ruby ink is on the higher end of the price spectrum and thus considered luxury ink, retailing for $35.00. However, it is available on our website for a reduced price making it more affordable. Regular edition Edelstein inks are available for slightly less. We found a reasonable dry time of approximately 6-7 seconds while using Pelikan Edelstein Star Ruby ink on Rhodia paper with a glass dip pen. Actual dry time will vary depending on the paper used, nib size used and the stroke of your pen (heavy or light). Pelikan Edelstein Star Ruby ink has a reasonable dry time for a medium saturated ink, making it useable as an everyday ink color. During regular use, we experienced no bleeding while testing Pelikan Edelstein Star Ruby ink. However, during our cotton swab test, we did find a slight amount of bleeding, but only at the most saturated points of the test. During normal use, we found no feathering while testing Pelikan Edelstein Star Ruby ink. However, during our water test when a wet cotton swab was run over the ink sample some feathering occurred. 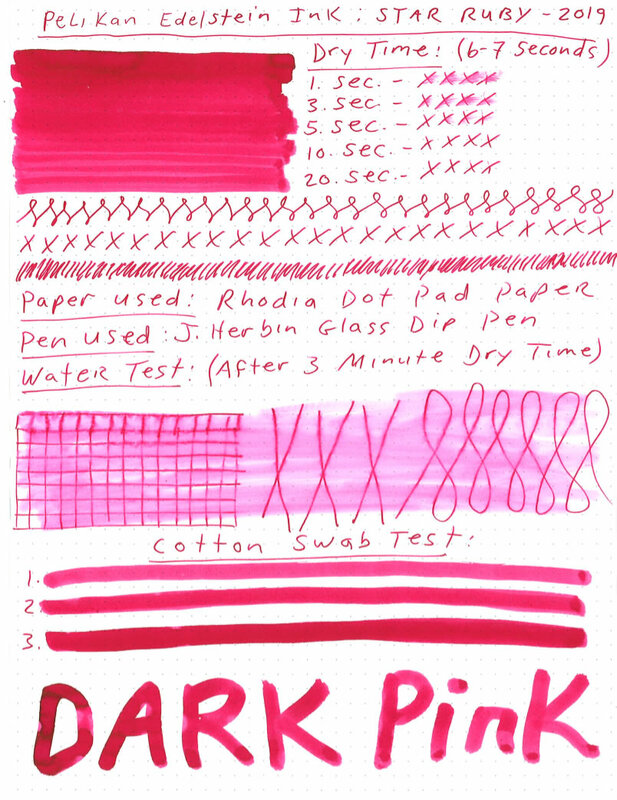 During our review of Pelikan Edelstein Star Ruby ink, we conducted a water test where we ran a wet cotton swab over an ink sample that had dried for about 3 minutes. Our results were significant color smearing, not unusual for a dark ink color. Some slight feathering occurred at the wettest points of the test. The lines remained fairly clear and distinct except at the wettest points of the test although Pelikan Edelstein Star Ruby ink is not a waterproof ink color. Pelikan Edelstein Star Ruby ink will produce some nice shading depending on the writer’s pen, writing style and paper used. Very dark pink-red to light pink shades are possible as well as varieties of color in between. Many feel that each of Pelikan’s new ink of the year colors are must-haves regardless of the color. Although this may be true, Pelikan Edelstein Star Ruby ink is a beautiful vibrant pink color, worthy of being purchased even without the “ink of the year” moniker. Pelikan Edelstein Star Ruby ink has a nice saturation to it, flows well, is dark enough to show up well, almost like red ink. It has a quick dry time, will shade beautifully and comes with one of the top bottles in the industry. Happy writing from Germany! I’ll definitely have to add this ink to my wish list! Lovely color. Looks like a great markup ink! I haven’t tried any Edelstein inks, but need to add them to my list! The Edelstein Star Ruby fountain pen ink is darker than Pilot Iroshizuku Tsutsuji. It’s very tempting to buy a bottle. I liked the Pelikan Edelstein line in their other colors and this one does not disappoint. My favorite ink is Diamine Lilac Shimmer. I love the Pelikan Edelstein inks I have used, and I love pink. Oooh, although I have the Lamy vibrant pink, I think this colour will fit also my collection. Edelsteins are great. Love this color. Interesting colour and the brand is quality so of course I’d like to try it! Such a lovely color! I would love to try this. Thank you for such a generous giveaway! This is a nice bright color! I’ll be curious to see what the matching pen looks like. Great ink. I would like to see some of the standard Edelstein inks reviewed. Can’t wait for this year’s Pelikan Hub to pick up this ink. I still like Olivine way better. Nice hot pink! I only have one edelstein ink, a Sapphire. It’s a fave of mine. I like the Jade and I tried a sample of the Smoky Quartz. Both are lovely. This Star Ruby ink looks nice too. It is actually the stone in my high school class ring, from way back when. What a nice vibrant colour! I have the Edelstein Olivine, which I absolutely love. So I would love to have this one in my collection too. Mmmm these inks are on the wish list. I don’t use a lot of red ink, but Edelstein inks work really well for me, so this one is under consideration. Interesting color. That you for the review.